Avexir is a little-known company compared to the giants of PC memory such as Corsair and Kingston, but it does make some very pretty RAM. PC Gamer got a look at some of that flashy RAM, complete with bright LEDs, a few months ago. 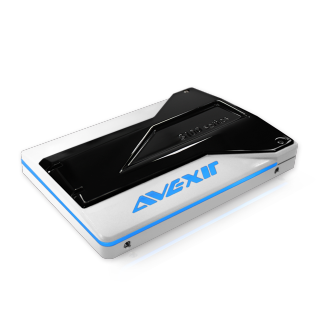 Now, Avexir has moved into the SSD market, announcing the S100. The S100 is powered by a JMicron controller, and uses original NAND flash chips. It has sequential read/write speeds of 540/450 MB/s, with 80,000 IOPS random 4k write. The S100 comes with “an exclusive designed SATA cable and 3.5-inch bracket. It comes in 120GB, 240GB, and 480GB capacities with a three year warranty. The specs for the S100 aren’t mind-blowing, but if you’re thinking about building a PC that's more about design than function, then it could be a fun way to go. Avexir hasn’t announced any pricing information yet, but you can expect it to be a bit pricier than SSDs with similar stats.